Last week I posted a bit about my goals (which included goals for this blog content). Well, goals are only as good as the plans you make to achieve them, so I spent some time yesterday making up an actual blog content calendar and schedule for the blog. Here’s what it looks like. 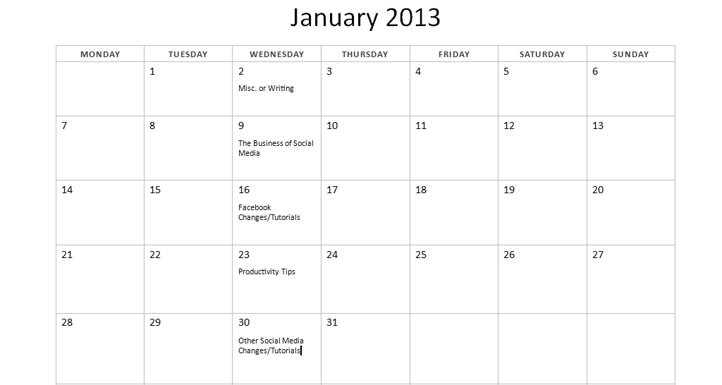 This is just a basic schedule, but it gives you a good idea of the topics I’ll cover from week to week. As you can see, I will cover a lot more than just Facebook or other social media topics. Also, I plan to post once a week. I might, on occasion, post blog content more than once a week, if I find something that I really want to write about. But posting at least once a week (along with my other content goals) will go along way to making up for what I didn’t do this past year. I’m pretty happy with this schedule overall. We’ll see how it changes as the year goes along. Oh, and don’t forget to make blog content “King” in 2013!